US Secretary of State makes first of its kind visit to Western Wall by high-ranking diplomat. 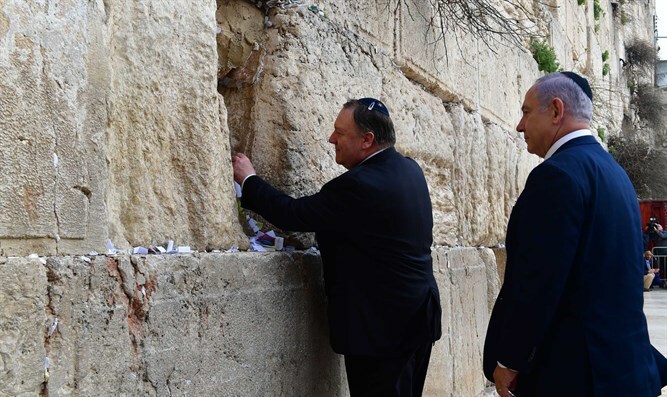 US Secretary of State Mike Pompeo visited the Western Wall with Prime Minister Binyamin Netanyahu Thursday afternoon. The two were also joined by US ambassador to Israel David Friedman, the rabbi of the Western Wall Shmuel Rabinovich, and the director of the Western Wall Heritage Foundation, Mordechai Eliav. The delegation then toured the Western Wall Tunnels, the Wilson excavations and visited the Shaarei Teshuva Synagogue in the Western Wall tunnels. The secretary's visit was unusual for such a high-ranking diplomat, and the first by an American official with an Israeli leader. "The trip to the wall is something that I've been talking with Prime Minister Netanyahu about doing some time ago. It's our first chance to go there together," Pompeo told journalists before his visit. "I think it's important. I think it's symbolic that a senior American official go there with a prime minister of Israel," he added, calling the Western Wall "a place that's important to many faiths."